How much does each model weigh? What is the stride length? The stride length is the linear distance a point on a rider’s foot travels during the power stroke of the pedaling motion. 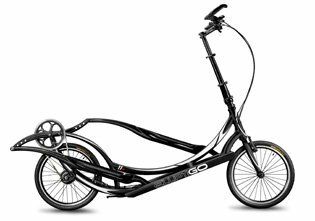 ElliptiGO elliptical bikes have a longer stride length than most indoor elliptical trainers, and it is adjustable out to 25″ or down to 16″. We have found that the longer stride length makes the riding experience feel more like running. How wide is the rider stance? One of the things we noticed when using an elliptical machine was that the drive arms seemed to be spaced further apart than our feet would be when running. We measured several elliptical trainers and they had widths of up to 11″ between the centerline of the drive arms. We designed our bikes to provide the least amount of distance we could between the foot platforms. As a result, the distance between the centerline of each drive arm is about 9-inches, and the space between the inside edges of each foot platform is about 3.5-inches. We believe that this narrower design contributes to the running-like experience.